Jewish Flint residents work to help others avoid contaminated water. Joyce Labiner runs the water in her Flint kitchen and sees a colorless liquid. She is thirsty, but she has become used to turning off the faucet and reaching for yet another bottle of water delivered by her daughter or a caring neighbor. It took a bit of time for Labiner to get into the burdensome and stressful routines required to avoid ingesting unseen lead seeping from corroded water pipes into city households. Sometimes, arthritis makes it difficult for her to open bottles, and she reverts to tap water. The 40-year city resident and her husband, Eli, are homebound and listen to news reports updating a nearly two-year timeline in the developing crisis — starting with the switch away from Detroit water sourcing to Flint River sourcing and going beyond the return to the Detroit supply last fall, when government officials began to admit to the dangerous tainting that continues from the improperly treated river water. The couple did not experience severely discolored, distasteful, malodorous tap water, but she has sensed a chemical taste. She is glad her neighbor volunteered to install a filter. The Labiners, members of Temple Beth El in Flint Township (where the water is safe), are among an estimated 200 Jewish residents living in the city of Flint facing the contamination and looking for relief. The Flint Jewish Federation has begun a campaign to help supply residents with bottled water, filters and lead testing kits. Staff members are collecting donations of items and money — all to be turned over to agencies in charge of distribution. Steven Low, Federation executive director and interim director of Jewish Community Services (JCS), heads outreach efforts. While JCS regularly offers transportation to doctors’ appointments, Low reports receiving one call to take someone for water and expects more such calls as home-delivered water is depleted. Joyce and Eli Labiner have lived in the city of Flint for 40 years. Homebound now, they try to use only bottled water. Low, who has been working in Flint for about four years but lives outside the city, drinks bottled water at the office, where staff members have abandoned the coffeemaker connected to pipes and shifted to making their coffee using bottled water. Jewish Community Services, which sponsors a communal meal program and Meals-on-Wheels based at Temple Beth El, can accommodate Jewish and non-Jewish Flint residents having critical problems getting safe food. The program is under the direction of Susan Low. Nancy Hanflik, who has lived in the city since 1978 and has held membership in Temple Beth El and Congregation Beth Israel (also in Flint Township), uses bottled water for cooking as well as drinking. She laments the burdens of having to pay water bills while buying safe water that needs to be lugged and stored. Although her home water looks clear now, she went through a time when the water flowed yellow and brown with noxious odors. She never experienced rashes or other problems described by some since lead was found. Hanflik, who says her neighbors have had their water tested with results showing lead levels three times higher than acceptable, wants to accelerate solutions through her continuing membership on the Tuuri Health Advisory Screening Committee of the Greater Flint Community Foundation. Hanflik works in her husband, Henry’s, law office where they both keep a schooled eye on class actions filed by other law firms against officials charged with being responsible for the contamination. 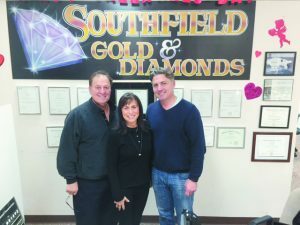 Janis Eisman, who lives outside Flint, works with husband, Harvey, and son, Rob, in operating Southfield Gold & Diamonds and National Pawn Brokers Outlet, two adjacent stores in Flint. When the Eismans go to restaurants in Flint, they ask for bottled water, understanding that food preparation and cooking are done with tap water. They hope their lead exposure is at minimum. Myra White lived in Flint for 50 years and was a member of Temple Beth El before moving to West Bloomfield several months ago. While the water did not motivate the move, she feels lucky that she relocated before the water situation was known to be so dire. “I bought the bottled water even when we were told the water was acceptable,” says White, a retired English teacher who worked at Mott Community College in Flint. Since moving and establishing herself with a new doctor, White recently asked if she should be tested for lead in her system. The answer was yes, and she will do that. 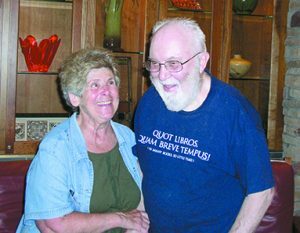 William Bernard, a retired family practice physician who has been a board member of the Flint Jewish Federation, had an office along the boundary of Flint and Flint Township. He saw many patients from the city, and his concern for their families has not retired. He hopes the damaged pipes will be replaced as soon as possible, regardless of cost. If Bernard still were in practice, he would advise parents to have youngsters tested for lead and then undergo available detox therapy as appropriate. Getting involved in solving problems associated with the water crisis is the anti-stress advice of Cheri Dickinson, a social worker and therapist with Oakland Psychological Clinic treating Flint residents. 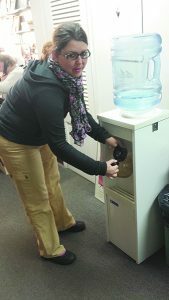 Dickinson, a member of Temple Beth El who has been an adviser for Flint Reform Temple Youth, encouraged her group to collect water for a local food bank. Gabe Goldman, a Jewish environmentalist serving as director of the Outdoor Jewish Classroom in Pennsylvania, was invited to speak at both the temple and synagogue in Flint Township long before the lead crisis became widely known. He was very disturbed by what he witnessed during a January weekend in the area despite knowing that various governmental agencies are investigating the issues. To make donations of money for bottled water, filters and lead testing kits to help the people of Flint, contact the Flint Jewish Federation at (810) 767-5922 or flintfed.com. One person working at the governmental level to ease the water crisis has ties to that area’s Jewish community. Jordan Dickinson, a legislative assistant in the office of Democratic Congressman Dan Kildee, grew up in Grand Blanc and has joined family during activities at Temple Beth El in Flint Township. Dickinson has been researching the lead issues since last September, when individuals outside the government began calling attention to the dangerous levels of lead. “I feel I’m helping people who really need help, but it’s also a personal issue because of where I was raised,” says Dickinson, 25, who first was asked to look into problems raised by the congressman’s constituents when discoloration, bad tastes and odors were experienced in home water supplies. Although told by environmental agencies that the tap water was safe, Dickinson eventually went to experts doing their own testing. Part of the congressional team since 2013, Dickinson has responsibilities for looking into issues involving environment, infrastructure, health care and water safety. He is a public policy graduate of Michigan State University. 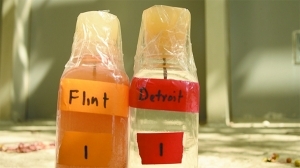 Dickinson’s interest in the people of Flint, especially those in low-income sections, falls in line with the interests of his grandmother, Peppy Rosenthal, a social worker now living in Florida and once active in the Flint community. A humanitarian award was named after her. Local efforts yield tons of bottled water; you still can help. Metro Detroit’s Jewish community has reacted to the crisis in Flint by collecting bottled water, monetary donations and even non-mixing baby formula. Temple Shir Shalom in West Bloomfield spearheaded an effort to gather a semi-truckload of bottled water to deliver to the Food Bank of Eastern Michigan in Flint this week. At press time, B’nai Israel Synagogue and Temple Israel, both in West Bloomfield, Congregation Beth Shalom in Oak Park, Adat Shalom Synagogue in Farmington Hills and Congregation Shaarey Zedek in Southfield had joined the effort. By the end of last weekend, Shir Shalom alone had collected 6 tons of bottled water. A Corrigan Movers truck will take the water to Flint. 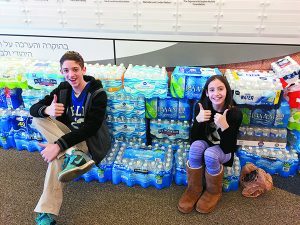 Hillel Day School in Farmington Hills is conducting its own bottled water collection through Friday and is sending its supplies through Art Van, which uses its trucks to make deliveries to Flint. Teachers Yifat Golan and Dana Friedman coordinated the effort for Student Ambassadors, a program that invites students to apply to represent Hillel in the community and work on behalf of the school and learn leadership skills at the same time. Goodman Acker PC law firm in Southfield collaborated with State Rep. Jeremy Moss to collect bottled water and other supplies at the Southfield Public Library. In partnership with Federation’s NEXTGen, Moishe House Royal Oak and Repair the World, The Well hosted a learning session about water issues using secular poetry, biblical and rabbinic selections and modern articles. Bottled water also was collected. The Flint Jewish Federation is collecting monetary donations at www.flintfed.com, or consider giving through a special fund set up by the Jewish Federation of Metropolitan Detroit — 100 percent goes directly to the Flint federation and to the Flint Child Health & Development Fund, led by the United Way of Genesee County and established at the Community Foundation of Greater Flint to ensure that children are afforded the resources and interventions to overcome this population-wide exposure to lead. 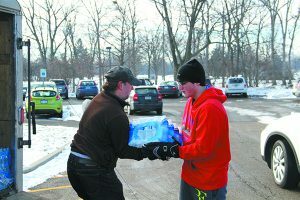 Go online to https://action.jewishdetroit.org/events/flint-emergency-donation.